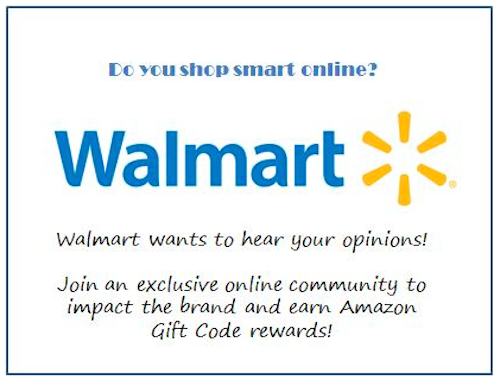 If you use your mobile and electronic devices to search for promotions and reviews, browse your favorite online stores, or even make purchases… then you should apply for Walmart’s exclusive online community where you can learn from other digitally savvy shoppers like you, and impact Walmart’s future products and services. 15 Responses to Are you a smart shopper? Walmart is looking for YOU! That pocket change could add up! Nice share! That’s pretty cool. Amazon codes always come in handy! Awesome! Amazon codes are always welcome! How come I’ve never heard of this? Gotta share with my family also. Thanks! Thanks for sharing this opportunity with us hun!That money can quick add up to a nice chunk of change. Happy Friday! Thank you so much for letting us all know! I have joined, we shop at Walmart every week. I’ve just just up and I love offering my feedback, especially if it helps a company improve on something they’re lacking. i love Walmart, I will complete the survey. I’m there like twice a week. That sounds like an easy way to get rewarded. I’ll be applying. This would be a wonderful side project for my mother. She is at a Walmart store at least twice a week!